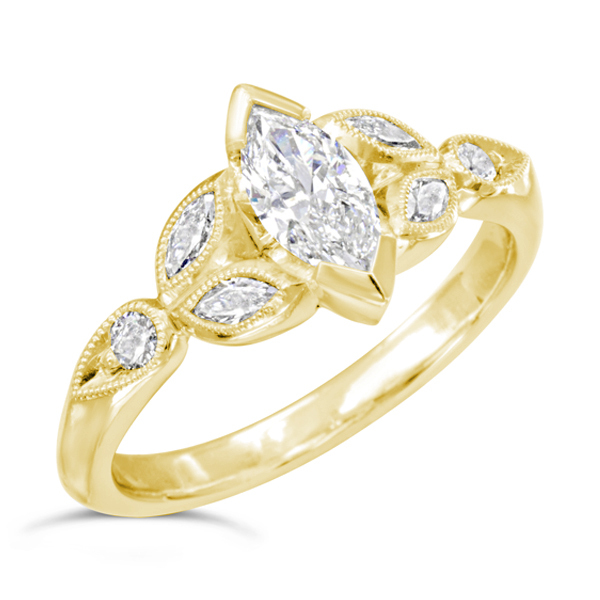 Gold Vintage Marquise Diamond Ring. Handmade in 18ct yellow gold this lovely vintage looking ring features a GIA certified marquise diamond measuring approximatly 8mm x 4mm. 4x2mm marquise diamonds are set in the beaded petal design either side of it with 2mm round diamonds at the end of the ring shank. Also available in platinum this engagement ring sits up against a wishbone wedding band. Either ring is fun to wear alone.